A Gateshead-based shopping and leisure complex is hoping to make a difference by pledging to support the Neonatal Unit at Newcastle’s RVI through The Tiny Lives Trust. A fundraising event at Trinity Square as part of the One Great Day family fun day raised over £600, which will be split between Great Ormond Street Hospital and The Tiny Lives Trust. 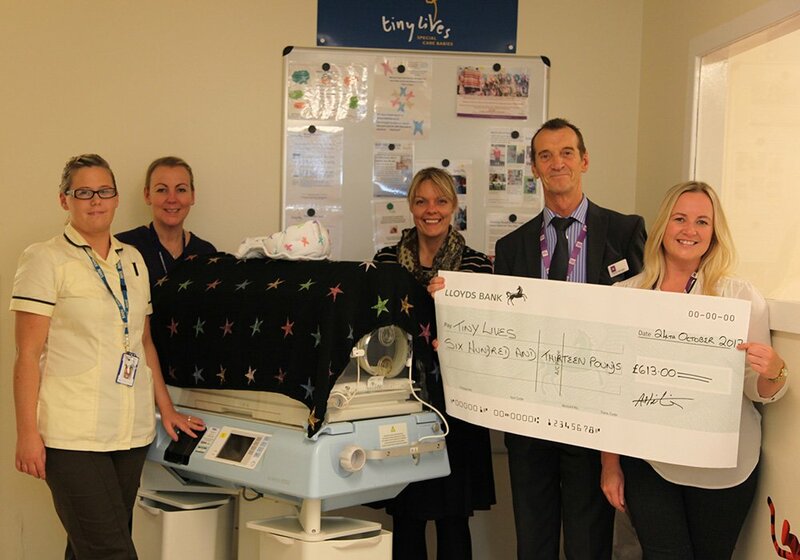 Trinity Square sees this as the start of the fundraising support and Centre Manager Tony Pickering and Admin and Commercialisation Co-Ordinator Kerry McKay visited Ward 35 at the RVI to present the cheque and confirm their commitment to support The Tiny Lives Trust going forward. The Tiny Lives Trust, which supports the Neonatal Unit at the RVI in Newcastle relies purely on fundraising to carry out its valuable work supporting parents and their premature and sick newborn babies. It needs to raise around £250,000 a year to operate. Tony Pickering said: “The visit to the Special Care Baby Unit at the RVI was incredibly moving. Seeing the work done by the dedicated team of professionals on the ward and how Tiny Lives is helping to bring comfort to the parents of fragile poorly babies in the very anxious first hours, days and weeks of life. Louise Carroll, Administrator and Fundraiser with Tiny Lives Trust, said: “Our thanks to Trinity Square Gateshead for choosing to support Tiny Lives. And a very big thank you to our volunteers and the general public who came along on the day. The funds raised will help us to continue supporting the Neonatal unit at the RVI who look after premature and sick newborn babies and their families as they battle through weeks and sometimes months on the Unit”.